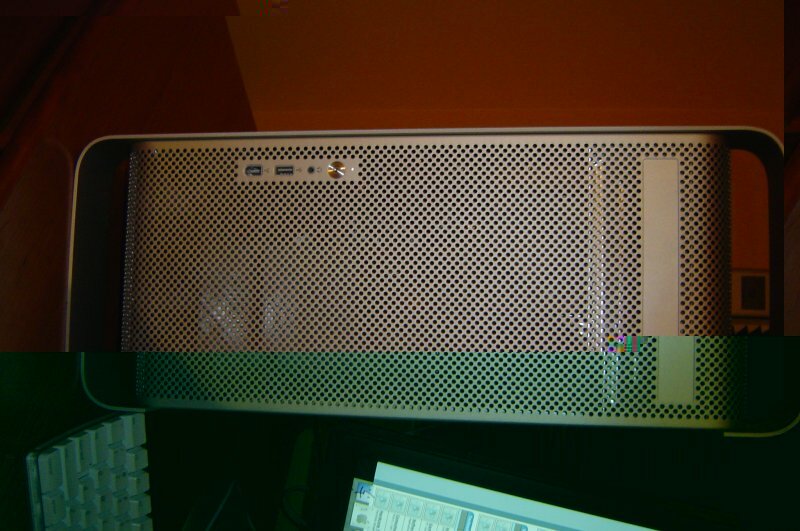 The entire case is made out of anodized aluminum, and the front and back are covered in little �holes.� There are so many, I would say that the front/back panels are only about 70% material. 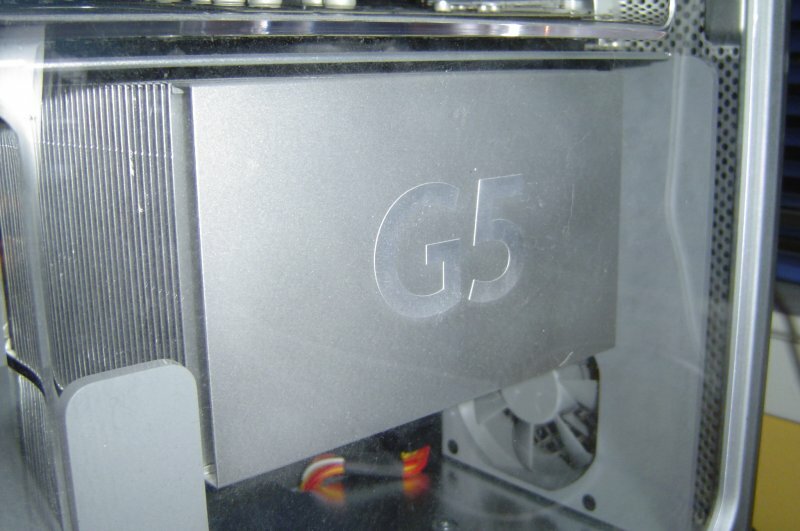 Not only does this help the appearance of the G5, it also helps airflow. On the front panel, you�ll find quite a few things. First off is, of course, the power button. 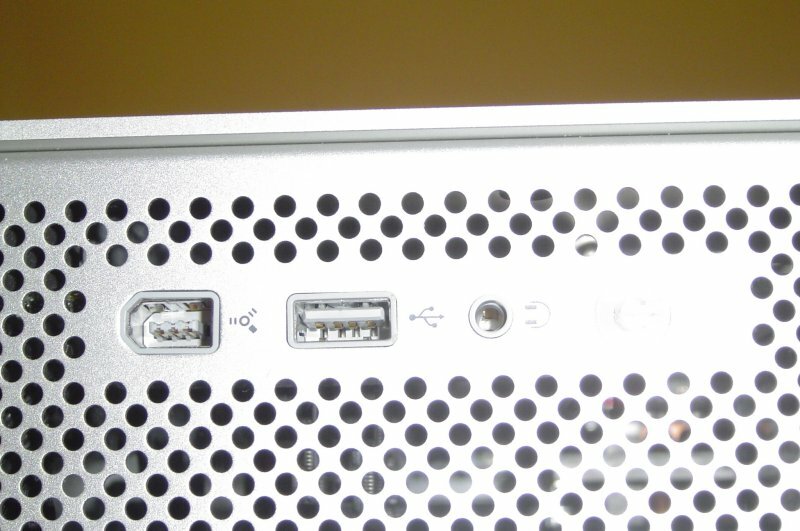 There�s also a headphone jack, a Firewire 400 port, and a USB 2.0 port. Lastly, there�s the optical drive tray. 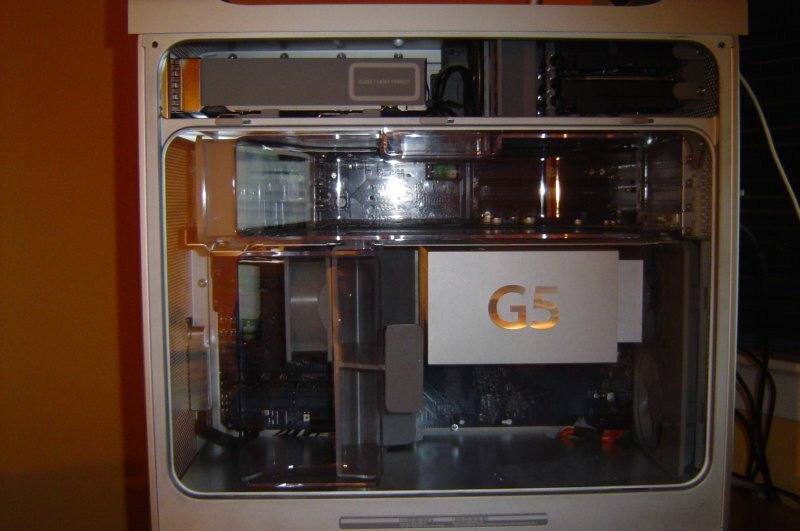 This brings me to my first disappointment with the G5; it only supports one optical drive �at a time.� Even the previous Powermac�s had multiple drive trays. 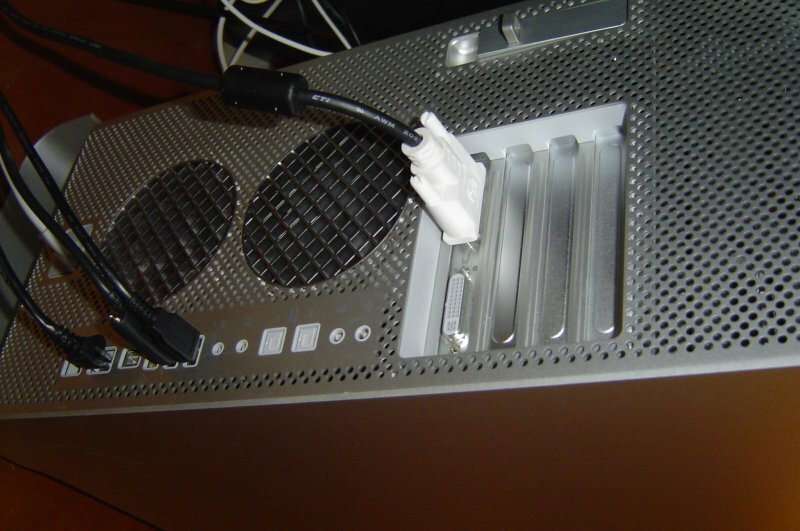 While I�m sure the simplicity of simply one optical drive looks best, sometimes, you need to figure functionality over design. 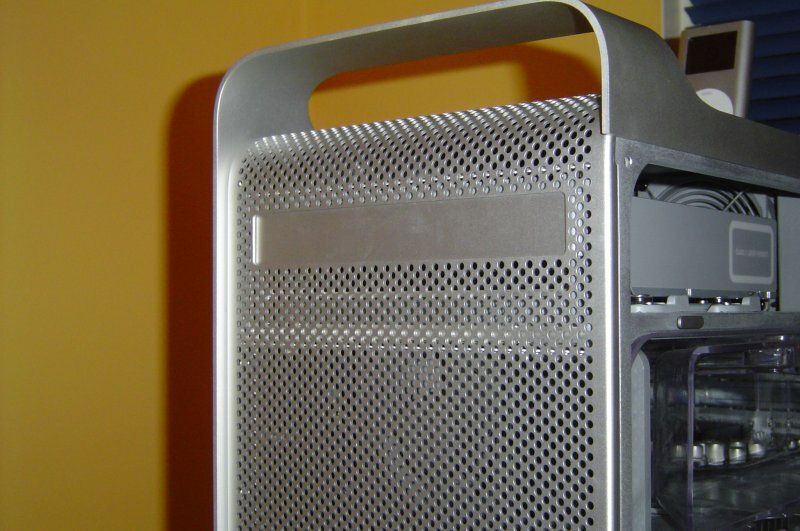 I hope that in the next Powermac revision, Apple will add the second optical drive bay. There are quite a number of ports on the back. On the top are the PCI/PCI-X slots (depending on which G5 model you choose), and the AGP 8x slot (video card). Below that you�ll find the location to install your Airport Extreme and Bluetooth antennas (both optional and cost extra). 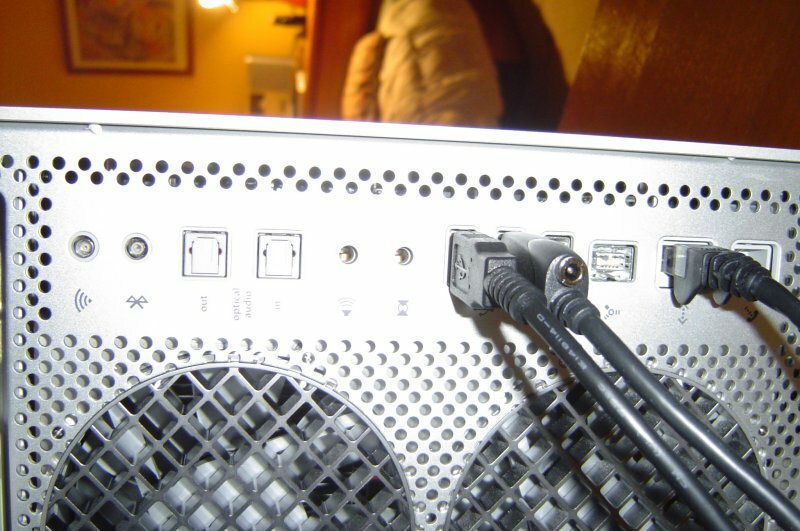 Below that are the optical in/out ports, the audio ports, two USB 2.0 ports, a Firewire 400 port, a Firewire 800 port, a 10/100 Gigabit Ethernet port, and lastly, a 56K v.92 modem. The back is very well organized and looks quite nice. 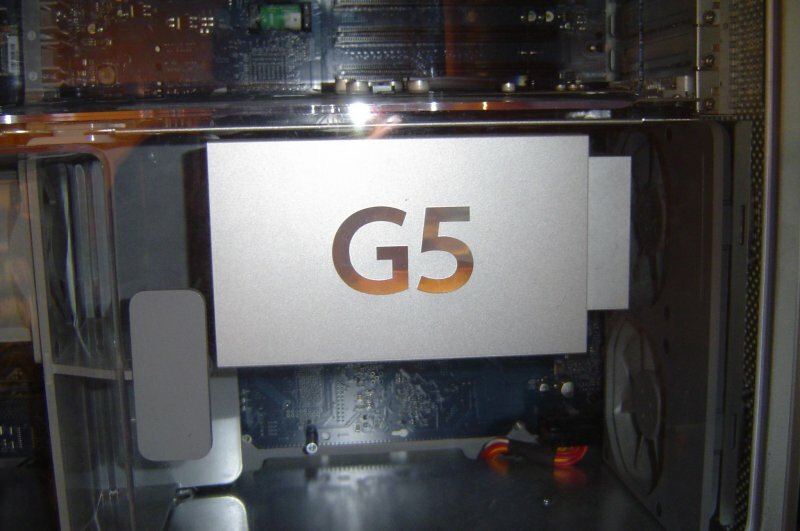 Taking off the right side panel reveals the �innards� of the G5. This has really got to be the neatest computer interior I have ever seen. Everything seems to �fit� together, and it really does work. There are 9 fans inside the case, which may lead you to think that this is one loud sucker, but it is quite the opposite. In fact, it�s quieter then any PC that I�ve ever used. How is this, you ask? It�s quite ingenious, actually. There are four cooling zones in the PC. The top part, where the optical drive/HDD�s are located, the middle/top part, where the PCI-X/PCI/AGP cards are, the middle bottom, where you can find a processor, and the bottom, where, on dual configurations, you�ll find another processor. There is a thermal sensor in each zone. During normal use, the fans run extremely slow, so they produce almost no noise. If a certain zone gets hot, only the fan(s) in that zone speed up, so while there is more noise being produced, it is significantly less then having all 9 fans speed up. Apple sure did think on this one, and the final result is impressive. When you first remove the side panel, there is a plastic �covering� that you must take off before you have access to the components. Taking this off while the system is turned on sets off flashing red lights (literally) and the PSU fan gets extremely loud. Therefore, this is not recommended.